A rock-zapping laser and telescopic combination called ChemCam is getting a lot of attention with NASA's rover Curiosity landing on Mars. Here's an explainer, as well as more details about the mission. ChemCam can look at rocks and soils from a distance, fire a laser to vaporize the materials and analyze them with an on-board spectrograph that measures the composition of the resulting plasma. 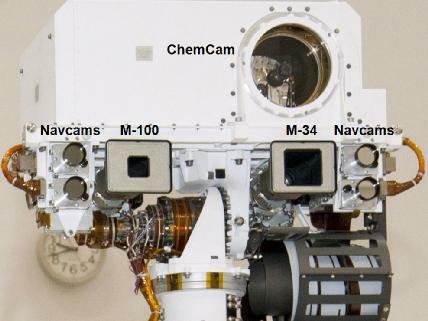 NASA says ChemCam can also use the laser to do less destructive things, such as clear away dust from Martian rocks as well as use a remote camera to acquire extremely detailed images. Roger Wiens, ChemCam principal investigator at the Los Alamos National Laboratory, gave a tutorial on how the instrument works at a recent news conference. "Curiosity's remote sensing instrument [is] designed to make a large number of rapid measurements in some sense to help guide the rover to the most interesting samples," he said. He also talked about ChemCam's imaging capability and said in routine operation the team plans to take images either before or after the laser operation or both, but not during the laser operation. "The camera is very high resolution. It's sensitive enough to image a human hair quite easily by seven feet away," he said. After nearly two weeks on the dusty red planet, Curiosity is doing warm-up exercises and getting ready to take off for its first drilling for a rock sample -- to a place 1300 feet away scientists have named Glenelg, a spot where three kinds of terrain intersect. In the next few days, the one-ton, six-wheeled mobile Mars laboratory will exercise each of its four steerable wheels, turning each of them side-to-side before ending up with each wheel pointing straight ahead. Curiosity will continue warming up by driving forward about 10 feet, turning 90 degrees and then reversing about sevn feet. Tonight the rover will zap its first rock -- one which scientists have dubbed "Rock N165," a three-inch wide Mars rock that sits about 10 feet away from Curiosity. "It is not only going to be an excellent test of our system, it should be pretty cool too," Wiens said. Want to hear the rest of the news conference for yourself? Visit NASA's USTREAM site, where it's all yours. NASA has dedicated an entire section of its website to its Mars mission and really everything you'd want to know about it is right there. 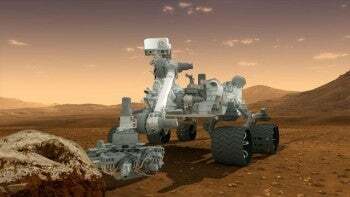 Otherwise, PCWorld's Ian Paul has put together a thorough guide on how to track the Mars rover using a plethora of online tools. Check out Mars Rover Curiosity: A Complete Guide to Tagging Along Online.